COLLECTORS NOTE: ON THE TITLES INCLUDED HERE OF JOSHUA TREE, BOY, WAR, OCTOBER AND UNDER THE RED BLOOD SKY -THESE ARE THE ORIGINAL 2007/8 ISSUES WITH THE UNIQUE MARKETING STICKERS STILL ATTACHED ON THE FRONT OF THE PLASTIC WRAP TO VERIFY IT'S ORIGINAL PRESSING ISSUES OF A DECADE AGO. THE RECENT RE-ISSUES OF THESE PRESSING HAVE THE SAME RELEASE DATE BUT DOESN'T INCLUDE THE ORIGINAL EDITION STICKER FROM THESE ORIGINAL 2007/8 ISSUES. FOR COLLECTORS OF 1ST ISSUES THESE STICKERS ARE THE ONLY WAY YOU CAN VERIFY YOU OWN THE 1ST EDITION OF THIS U2 PRESSINGS. MANUFACTURES ARE CHEATING THE COLLECTOR THESE DAYS WHEN THEY DO A RE-ISSUE ALMOST A DECADE LATER. IN THE OLD & HONEST DAYS MANUFACTURES NEVER PLACED THE SAME UPC CODE ON A RE-ISSUE LIKE THEY DO THESE DAYS. BUT LUCKY THAT SELLERS LIKE US CAN PROVIDE COLLECTORS WHO WANT TO PURCHASED THE 1ST GENERATION FOR THEIR COLLECTION WERE ABLE TO POINT OUT THESE VERIFY STICKERS TO SEPARATE THE 1ST GENERATION FROM THE RE-ISSUE FOR COLLECTORS. PLEASE NOTE IN OUR PICTURE THOSE STICKERS ON THESE TITLES BECAUSE THEY ARE NOT APART OF THE RECENT RE-ISSUES. High definition analog vinyl pressing for superior fidelity. The nicest thing you can do for your stylus and ears. The ultimate record – the way music was meant to be heard. 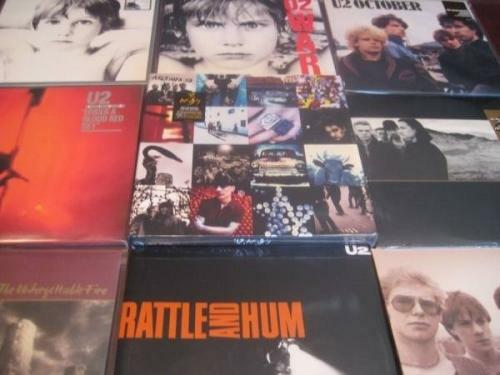 U2 RATTLE & HUM DOUBLE FACTORY SEALED LP LONG OUT OF PRINT TREMENDOUSLY RARE AND IS ONE OF THE ANCHORS OF THIS COLLECTION- MANY TITLES OUT OF PRINT & OUR LASTSET FOREVER. Rattle & Hum was equal parts soundtrack to the band's documentary and the follow-up to their career making blockbuster The Joshua Tree. Peppered with live and studio tracks, some of the standouts are "Angel of Harlem" and "Desire". Limited Edition 20th Anniversary Ultimate Collector's Edition! Deluxe Box Set with 2 180g Black Vinyl LPs of the Original Album & Bonus 12" Translucent double blue vinyl with remixes, B sides and more! In celebration of the 20th Anniversary of Achtung Baby, U2 releases this Limited Edition Deluxe Box set including the original album on two 180g Black Vinyl LPs along with remixes, B sides and more on two Translucent Blue Vinyl LPs. Achtung Baby was the 7th studio album by the iconic European rock group. After taking a hit by critics of their 1988 Rattle and Hum release, U2 shifted their musical direction to incorporate alternative rock, industrial, and electronic dance music influences into their sound. The group began recording Achtung Baby in Berlin's Hansa Studios in October of 1990 during the German reunification. The sessions were plagued with conflict while the band argued over the direction and quality of material. Finally, the group made a breakthrough with the improvised writing of the song "One". Morale improved when they returned to Dublin in 1991 and completed most of the recordings. Twenty years ago, Bono described Achtung Baby as “the sound of four men chopping down The Joshua Tree” while Jon Pareles of The New York Times wrote that “stripped-down and defying its old formulas, U2 has given itself a fighting chance for the 1990's.” The album won a Grammy® Award for Best Rock Performance and became one of the most significant records of the nineties and of U2’s career. The Achtung Baby archives have unearthed some previously unreleased songs from the recording sessions. With a raft of unreleased material, remixes and b-sides discovered, a full album of demo and early versions of the final 1991 tracklisting has also been revealed. U2 THE JOSHUA TREE 180 GRAM LIMITED EDITION AUDIOPHILE DOUBLE LP SET TREMENDOUSLY RARE OUT OF PRINTAND THIS IS THE ORIGINAL 2007 ISSUE WITH THE UNIQUE MARKETING STICKER STILL ATTACHED ON THE FRONT OF THE PLASTIC WRAP TO VERIFY IT'S PRESSING DATE. Newly Remastered! First Time Ever Pressed on 2 LPs! Cut with no compression or limiting, using wider groove spacing for better sound! Newly Remastered! First Time Ever Pressed on 2 LPs! This album plays at regular 33 1/3 rpm speed but was cut with no compression or limiting, Universal used wider groove spacing for better sound! The year 2007 marked the 20th anniversary of The Joshua Tree, the album which saw U2 become "Rock's Hottest Ticket". U2's biggest selling album to date, entered the US album charts at No. 7 and reached No. 1 three weeks later. It was U2's first album to reach No. 1 in the United States. In 1999, The Joshua Tree was awarded the RIAA's highest certification, Diamond, with 10 million units sold. The album and sleeve cover also placed No. 1 in Rolling Stone magazine's annual Music Awards chosen by readers. Critics at Rolling Stone made it No. 2 album of the year. U2 also won Album of the Year and Best Rock Performance By a Group or Duo a the Grammy Awards for The Joshua Tree. Rolling Stone 500 Greatest Albums of All Time - Rated 223/500! Rolling Stone 500 Greatest Songs of All Time - "New Year's Day" - Rated 435/500, "Sunday Bloody Sunday" - Rated 272/500! Ireland's premier pop/rock band, U2, burst onto the scene in the early eighties and were dominant through the early nineties! War features such U2 classics as: Sunday Bloody Sunday, New Year's Day and Two Hearts Beat As One. A piece of '80s nostalgia. • Mastered by Arnie Acosta. • Cut by Bernie Grundman at Bernie Grundman Mastering. U2 OCTOBER 180 GRAM LIMITED EDITION AUDIOPHILELP ALSO TREMENDOUSLY RARE NOWAND THIS IS THE ORIGINAL 2007 ISSUE WITH THE UNIQUE MARKETING STICKER STILL ATTACHED ON THE FRONT OF THE PLASTIC WRAP TO VERIFY IT'S PRESSING DATE. Remastered version of the 1981 release. October features spiritual themes, inspired by Bono, the Edge, and Mullen's memberships in a Christian group calle the "Shalom Fellowship." The album questions the relationship between the Christian faith and the rock and roll lifestyle and features "Gloria" and "I Threw A Brick Through A Window". U2 UNDER A BLOOD RED SKY (LIVE) 180 GRAM AUDIOPHILE LIMITED EDITIONLP WITH 16 PAGE BOOKAND THIS IS THE ORIGINAL 2007 ISSUE WITH THE UNIQUE MARKETING STICKER STILL ATTACHED ON THE FRONT OF THE PLASTIC WRAP TO VERIFY IT'S PRESSING DATE. Under a Blood Red Sky captures U2 on the brink of becoming the world's most significant live band. It was originally released in 1983 but still sounds fresh and exhilarating 25 years later. Following the critically acclaimed War, which was released earlier in the same year and helped transform U2 into arena rock stars, Under a Blood Red Sky features material from U2's first three albums. A thrilling rendition of "Sunday Bloody Sunday" is the centerpiece of the record, and it is delivered here in outstanding fashion, with unsurpassed fire and passion. Many of these renditions are considerably tougher and less textured than their studio counterparts, but the band manages to draw on the energy from the crowd to deliver timeless performances. U2's reputation as the world's greatest live act, due in no small part to the sweeping success of Under a Blood Red Sky, would not be put to question for four more years, when The Joshua Tree won them their first Grammy Award and indisputably established them as simply the world's greatest rock band. Rolling Stone hailed Under a Blood Red Sky as "one of the 50 moments that changed rock and roll." It remains as relevant today as a quarter century ago, always inferential of a global backdrop of war and violence, and always the pride of any rock and roll collection. U2 The Unforgettable Fire 150 GRAM LIMITED EDITIONLP WITH 16 PAGE BOOKAND THIS IS THE ORIGINAL ISSUE WITH THE UNIQUE MARKETING STICKER STILL ATTACHED ON THE FRONT OF THE PLASTIC WRAP TO VERIFY IT'S PRESSING DATE. Rolling Stone 500 Greatest Songs of All Time - "Pride (In The Name Of Love)" - Rated 388/500! Universal Music and Island Records release this remastered LP to celebrate the 25th anniversary of this landmark album. The fourth studio album by U2 was originally released in 1984. More ambient than the hard-hitting War album, The Unforgettable Fire showed the most change in direction at the time. The album contains tributes to Martin Luther King, Jr. and Elvis Presley and contains the hit "Pride (In the Name of Love). This was the first collaborative effort for Brian Eno and Daniel Lanois. U2 How To Dismantle An Atomic BombGrammy Winning Album On Vinyl LP ISSUE! The album won all nine Grammy Awards for which they were nominated, including Album of The Year, and was added to the Rolling Stone list of the "100 Best Albums of the Decade" at number 68. Since Best of 1980-1990 and Best of 1990-2000 were not made available on vinyl format, this is the ultimate U2 fix to own and play on your turntable. ABSOLUTELY NO THROW-AWAYS or FILLERS. Every single cut rocks and in the process inevitably reminds you U2 continues to be the greatest rock band in the world today.